TORONTO, Oct. 10, 2018 /CNW/ - RNC Minerals (TSX: RNX) ("RNC") is pleased to announce the first specimen slab from the top of the Father's Day Vein discovery area has been successfully recovered at the Beta Hunt Mine. The slab was cut in the field, revealing impressive visible gold and quartz structures. 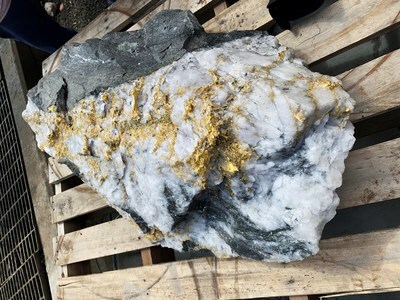 The slab, weighing approximately 90kg, is estimated to contain approximately 1,000 ounces of gold (see Figures 1, 2 and 3). 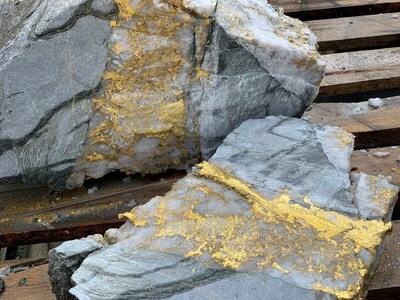 The large slab will be cut into a series of smaller specimen slabs which will highlight the coarse gold and related mineral features (see Figure 3). Final weights and gold content will be determined for each specimen slab once all have been cut. 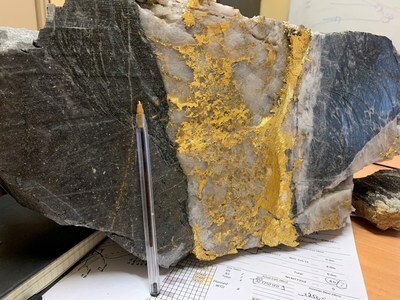 Mining operations are continuing to remove a second large specimen slab from the face of the Father's Day Vein and will extract additional high grade coarse gold over the coming week. "We expect that these spectacular specimen slabs will be highly sought after by mineral specimen collectors. With a minimum of 30-35,000 ounces expected from the Father's Day Vein area, the company will be in a substantial net cash position to fully fund its upcoming activities. 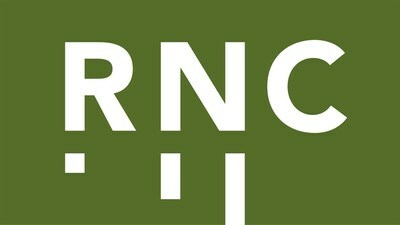 RNC will be able to accumulate smaller specimen stones as these are produced (based on the current faces, we expect that the next firings should generate a substantial number of specimen stones) and begin direct sales of these slabs and smaller specimens to the public, which we expect will allow us to capture the significant premiums above their gold content. Once the backlog of coarse gold at the Perth Mint has been processed, we expect to provide production results for the third quarter later next week. The technical team is continuing to advance their work on understanding the sediment structures in the mine, having already extended the known sediment structures by a total of 540 metres from the Father's Day Vein structure to the 1250 Level of the mine. I look forward to providing additional updates as this work continues." said Mark Selby, President and CEO of RNC. 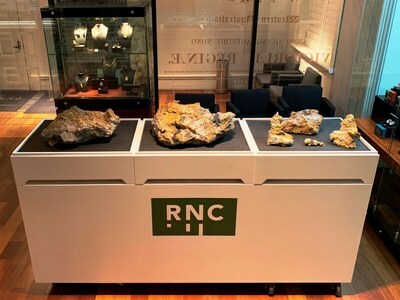 RNC Minerals is pleased to report that the Perth Mint in Western Australia now has a number of the gold specimen stones recovered from the Father's Day Vein discovery on display to the public (see Figure 4). Six gold specimens, weighing almost 200 kg in total, are on display. We believe these are among the biggest of their kind ever unearthed in Australia. The specimens were put on display on October 6 and will remain on display for approximately three weeks. The display at the Perth Mint is testament to size, quality and uniqueness of the specimens recovered to date from Beta Hunt. The Perth Mint is Australia's largest fully integrated, innovative precious metals enterprise, providing premium gold, silver and platinum products and services to markets throughout the world. This news release contains "forward-looking information" including without limitation statements relating to expected production and discovery results, related cash flows, the liquidity and capital resources of RNC, the potential of the Beta Hunt and Reed mines, as well as the and the potential of the Dumont development project and Orford Mining's Qiqavik, West Raglan, Jones-Keystone Loflin and Landrum-Faulkner exploration properties.